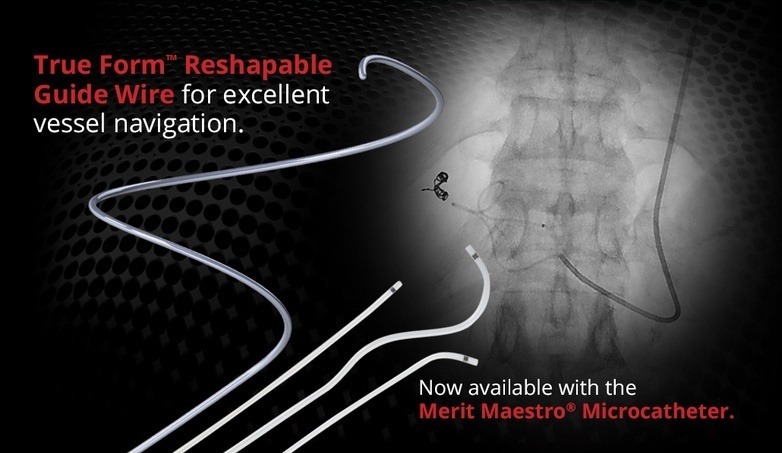 Merit Medical is thrilled to announce the launch of the True Form™ Reshapable Guide Wire, an innovative addition to our Interventional Oncology & Spine Delivery Systems Portfolio. The True Form is uniquely designed with a shapeable tip that can be shaped and reshaped multiple times for vessel cannulation, making it the go-to guide wire during endovascular intervention procedures. “The ability of the True Form Guide Wire to be shaped multiple times and keep its shape allows me to use the same guide wire, decreasing the need to use additional guide wires,” says Dr. Shinichi Hori, Chief Physician and Director at Gate Tower Institute for Image Guided Therapy in Osaka, Japan. The True From is also compatible with several microcatheters, including the Merit Maestro®. With a flexible, hydrophilic-coated distal region, nylon ribbon braiding, and a Swan Neck designed tip, the Maestro provides superior pushability, trackability, and flexibility. Merit knows that having a reliable microcatheter during embolization will enhance procedural efficiency and provide the outcomes expected for small vessel embolization. This is exactly why we’re prepackaging the Maestro Microcatheter 2.4F with the True Form Reshapable Guide Wire. Delivering this dynamic duo together in one box affords both convenience and ease of use from start to finish. Ordering is effortless when a preferred guide wire and microcatheter can be bought together with only one purchase order. What’s more, supplying these tools in a prepackaged form removes the unnecessary step of finding a guide wire and microcatheter that fit because clinicians already know the True Form and Maestro are compatible. Storing is also made simple by only needing to stock and pull one box from the shelf. The True Form Reshapable Guide Wire comes in several lengths to match diverse patient anatomy. For more information, visit https://www.merit.com/interventional-oncology-spine/accessories/guidewires/true-form-steerable-guide-wire/ or talk to your Merit representative today. For more information please refer to Instructions for Use. Consult product labels for any indications, contraindications, potential complications, warnings, precautions and directions for use. Dr. Hori is a paid consultant of Merit Medical Systems, Inc.